Hello people. I’ve been working on the pages of chapter 4 and there are several changes that I want to share with you . The pages now are made ​​entirely by computer, which greatly improves the picture quality. The size of the pages will change to better suit a printed version of the webcomic . 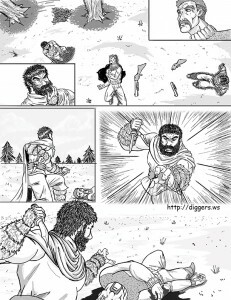 Thanks to the cooperation of Amerguin , now various shades will be used in the art to minimize the monotony of ” black and white.” I leave here a sample page so you can see the new changes. As usual, any critics , comments or suggestions are welcome .